I just got back from a fun weekend in Austin, visiting my friends Chris and Jeff. They were wonderful hosts and showed us a great time. Chris is an amazing cook and makes it look so easy. They hosted a dinner party one night and he threw together the most delicious dinner with such ease. This came about by accident actually. The neighbor made a delicious butternut squash soup and Chris was planning to grill some marinated prawns (marinated in garlic, olive oil, salt and pepper I think). He got creative and chopped the prawns up after grilling them and put them in the bottom of the bowl. Then topped with some soup and a little parsley. He also thought a little creme fraiche would be fantastic dribbled over the top but didn't have any. It was so good and a fun twist on traditional butternut squash soup. 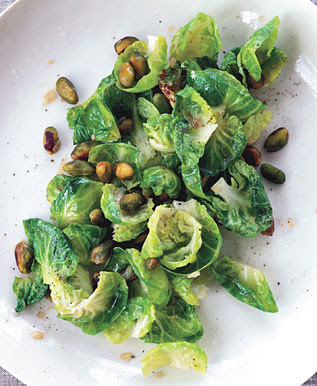 I have never been a huge fan of brussel sprouts but these were so good I had a huge second helping. Trimming the leaves off took a minute or two (understatement clearly as we made three bunches) but was worth it. I loved the presentation. This would be the perfect addition to your Thanksgiving dinner. It's a quick and easy preparation once you get the leaves trimmed. Recipe from Epicurious. I'm on the hunt for this recipe. It was absolutely delicious. There was a sauce made of crushed whole tomatoes in sauce, fish stock, orange zest and more. The halibut was served with wild rice and the sauce spooned over both. I ate every last bite. Delicious. I will post the recipe when I track it down.